There was once a maiden who had lived her entire life in a tall tower in the middle of a dark and almost impenetrable wood. Her father had locked her in there many years before. No one could exactly remember why any more. It seems that fathers did that a lot in the olden days. At least he made sure that she had a substantial store of provisions before vanishing completely from her life. The tower had no door - just a window at the very top at which the girl would sit and dream of all the wonderful adventures she would have, if only she could escape. With the passing of time it seemed her empty days grew longer and longer - and so did her hair. Just looking after it - washing, drying, brushing, combing and braiding it - became a full-time job, but certainly not one that relieved the tedium of her days. Stories of her beauty and her lustrous locks spread far and wide until one day a handsome prince rode by on a milk white steed, curious to see if the rumours he had heard were true. A single glance at the figure in the tower told him they were. But it seemed he would forever be condemned to worship her from a distance. Next minute there was a flurry of movement at the window. In no time at all the girl had lowered her braid - it was now the exact same height as the tower - and was beckoning him to climb. In even less time he had clambered up and was by her side. The handsome prince was full of tales of his great adventures in the outside world, of vast armies he had defeated, of entire kingdoms he had conquered and of countless maidens he had wooed and won. But none of these maidens, he assured her, could compare to her, because not one of them had such long and wondrous hair. The girl begged to be able to join him in his adventures. But of course her hair would be a hindrance and she would have to cut it off. He begged her not to do so - it was what made her so uniquely beautiful. He could never feel the same way about her without her glorious long hair. They argued late into the night until both fell asleep, exhausted. The prince awoke early the next morning, and to his disbelief, found he was quite alone in the room. Then he noticed what looked like the end of his lover’s braid tied to the leg of a chair. The rest of it was trained out of the window. He staggered across the room just in time to see the girl climbing to the ground. Her hair was cut short like that of a lowly pageboy. He couldn’t believe his eyes - she must have borrowed his sword while he slept. Years of fighting to keep her increasingly unruly hair under control had made her something of an expert in knot and ropework techniques. She gave the braid a short, sharp tug. Immediately it loosened from the chair leg and fell noiselessly at her feet. The prince’s heart leapt to his throat. “How on earth am I going to escape?” he cried. “Grow your own hair!” answered the maiden as she mounted the milk white steed and rode off into the sunrise. Anon, 1998, colour linocut, 57.5 x 38 cm. Curated by Susi Muddiman and Gail McDermott, the exhibition features works selected from the Print Archive of the Print Council of Australia. The exhibition will run from 27 March – 13 September. Anon was originally part of a body of work called Private Collection. It was exhibited at Australian Galleries, Melbourne, in 2000 and comprised drawings, miniature multi panelled paintings and relief prints. This series, which marked a major change of direction in my work, evolved after a visit to London in 1997. In a small upstairs room in Kenwood House on Hampstead Heath I discovered an astonishing collection of mourning jewellery and portrait miniatures. Subsequently I investigated other similarly fine collections, most notably in London’s Victoria and Albert Museum and the National Portrait Gallery. But it is the contents of that modest room at Kenwood House which had the greatest impact, possibly because this was where what was has been a long, ongoing journey began. 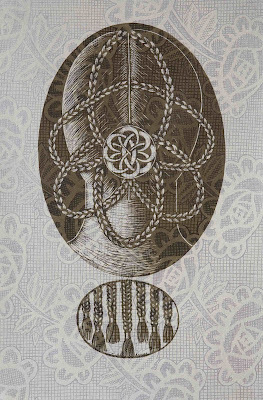 A significant part of my previous work, namely the Tattooed Faces and Figures, had focused on women's sewing iconography, sometimes incorporating motifs such as lace and other textile-related patterns. This eventually led to a number of experimental works wherein linocuts were printed onto fabric, layered and hand stitched. 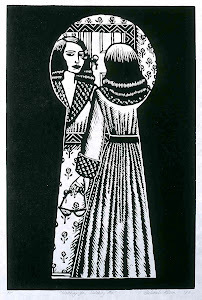 The last, and most ambitious, of these was The Daughter of Time (1997, linocut on white and grey interfacing with hand stitching 200 x 76 cm.) The last-minute incorporation of two overlapping oval braids was quite intuitive, little more than a compositional device. 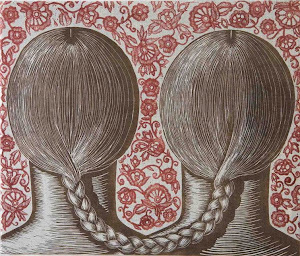 Uncannily, however, it anticipated the next phase of my work, in which hair, particularly intricately patterned knots and braids, would take centre stage. The motif of lace was also carried though in the majority of the relief prints that directly followed this work, including Anon. It is printed from two blocks onto semi-transparent Japanese Mending Tissue, which was chosen both for its sensitive and receptive surface and its resemblance to the fabrics with which I had previously experimented, particularly interfacing. As with the Fabric Pieces, the paper is an integral part of the visual language of the work. Initially the manner in which the hair in mourning jewellery was painstakingly woven and patterned translated into my own work as an extension of the sewing iconography I had previously employed. But very soon hair, with its opposing qualities of seductiveness and creepiness (as in the context of mourning jewellery) assumed a significance all its own. For Anon and its companion works, I extended my research to an investigation of Celtic knots. In order to exploit the increasingly intricate knots and braids to the fullest, I was obliged to turn my protagonists’ faces away from the viewer. The title of this work best describes their subsequent fate. It finally arrived! Many thanks to Paul Compton and Shane Jones for delivering the press and carrying it up all those stairs.